Following on from London’s biggest ever bike die-in outside TfL headquarters in November 2013 this campaign (visit its associated Facebook page and discussion group) intends to build a peaceful but more radical approach to fighting for safer infrastructure for all of the city’s road users, though with a focus on cycling, within a framework that drives the message home to those who really need to hear it. One year on, and we continue to protest radically: on 15 November 2014 we marched along Oxford Street behind a horse-drawn hearse and held a die-in at Marble Arch for ‘The National Funeral of the Unknown Victim of Traffic Violence‘. A few decades ago, the Dutch campaigned to reduce road danger, especially for young people that chose to walk or cycle, under the banner ‘Stop the Child Murder’ (‘Stop de kindermoord’) – it had an effect: after years of persistence The Dutch Got Their Cycle Paths. All road users are welcome to attend actions or join the campaign if they share and wish to express our concerns. There has been too much talk of war on the roads, and that only makes things worse. We’re trying to make things better. Joining is just a matter of turning up at an action, and – if you use Facebook – by showing your support and getting involved there. Volunteers are always welcome – without the amazing help we had from numerous people who created websites, printed and distributed flyers, made banners, offered PA systems, pestered media contacts – someone even built a bike-mounted stage for us on the day itself! 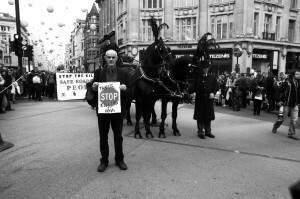 – etc the TfL die-in just couldn’t have been the amazing and historic event it was. A quick response (QR) code that when scanned with an appropriate application on your smart-phone will take you to this website. Hope the policy-makers-facing campaign goes well. I am based in Devon but am trying to make some small contribution by finding or making driver-facing memorable and shareable messages, presently via FB on https://www.facebook.com/aMetreMattersUK …. things that might lodge positively in a driver’s mind when they see a cyclist and overcome the bl**dycyclist mentality. Hi Alex, apologies for the delay in responding, but as we are no-budget and volunteer-run we are unable to keep up with everything as closely as we would like. 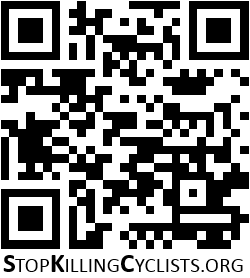 If you email us on contact@stopkillingcyclists.org with more details one of use will be able to get back to you. That email address is one-way but it is linked to another account from which we can reply. In theory though, I think we would be happy to be involved in the event. On the A217 in Sutton & Merton many cyclists do not use the cycle lanes that many of us campaigned for. I do not see the sense of riding in a 40 or 60 dual carriageway when there is a lane. This needs to be put across to riders. Is that because they are poorly connected, designed and/or maintained, or with big detours/loss of junction priority ? I don’t know the road living nowhere near there, but most cyclists would use good facilities, but so often they are poorly executed. I lived in Vancouver for many years and although the situation there has its challenges there is a fundamental difference to attitude toward cyclists. Road laws in North America make it a requirement for drivers to look for pedestrians and cyclists. In the UK the focus is the opposite – pedestrians and cyclists must make every effort to be seen and to avoid drivers. This is a fatal flaw. Even safety advertisements by the City of London focus on cyclists watching out for drivers not drivers watching out for cyclists. Walking or cycling in London is a very dangerous matter, things need to change. Would be good if some statistics could be compiled and provided to the press. It could be, given the comparatively limited number of cyclists in London- that is compared to motor vehicles, that the number of deaths and injuries may make it as dangerous or more so than some of the most recognized dangerous activities like base jumping, or approaching or worse than residing in a dangerous country like Honduras or DRC. According to Chris Boardman (on BBC Breakfast 3 Nov) more people are killed gardening than cycling. He emphasised that, its because of the aggressive way that people drive i.e. excessive/inappropriate speed and near misses, that terrifies people re cycling. I contacted TFL about 8-wheel construction traffic using Deptford High Street as a cut-through to avoid traffic lights and time in the local area. The lorries are driven fast and often dangerously. I have, after several emails received no proper response from TFL and there has been no attempt to addresses this. The current situation could easily result in a nasty accident on a busy high street. I would recommend anyone concerned to go and look what is happening on a weekday. I consider TFL a disgrace in not seeking even to make an effort. I am going to film what is happening and will be posting videos online and will keep you posted. 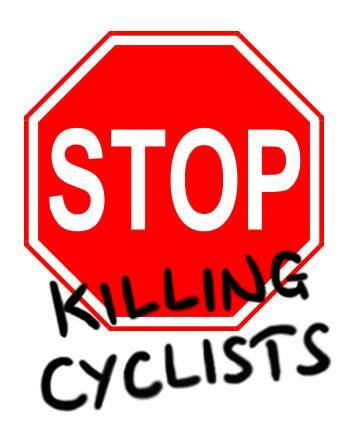 I ride daily in London and support this campaign, not least because I got wiped out in broad daylight by a car driving into me with the driver only getting a small fine and slap on the wrist. However, I cannot see how a “law that allows cyclists to treat red traffic lights as give way junctions” will improve safety for us and toughen sentencing on motorists who wilfully injure and kill cyclists. Please explain. I really hope this protest goes well…as something needs to be done. I was involved in a hit and run this week. As I cycled to work on Wednesday morning a van pulled into the bus lane before turning left and hitting me, knocking me off my bike and onto the ground. I was lucky…I only had a buckled wheel, cuts, and bruises to show for it. The recent spate of incidents has made me realise how at risk I am every day on the road. I reported the crime to the police, and it first I thought it was pointless. But with three people killed this week cycling in London, I am going to chase the police to find who committed the hit and run on me…who is to say this vehicle won’t do it again. I cannot make it to the protest on Sat, so once again, I do hope it has the impact necessary. One of the major contributions that cyclists make to modern living is the reduction they usually make in congestion (and pollution) for all other forms of transport. Maybe the next time a whole clutch of cyclists are mown down what is needed is not so much a ‘die- in’ as a taste (for everyone else) of what it feels like if all the cyclists get off their bikes and – as visibly as possible (carrying a helmet?) – use their cars or take up their places on buses and tubes and on the pavement. Maybe this needs to happen at a specific (rush hour?) moment and location – either as central or as close to the most recent accident as possible. Maybe then other road users would get the message. It’s not a war. Cyclists happen to be users of all the other forms of transport (including cars) as well. Perhaps after a demonstration like that – and it would indeed demonstrate something – non-cyclists would ‘get it’. People who use bikes are doing everyone else a huge favour. They shouldn’t have to risk their lives to do so. I organise a cycle from London to Athens to raise money for a refugee community centre in Athens. I’m really keen to make the first 5 miles into a cycle-protest with the message ‘refugees welcome’. Could you tell me about the legalities of this? I’d welcome any collaboration or advice!